Day Zero sounds like the title of a dystopian disaster movie, starring Matt Damon or an ageing Bruce Willis perhaps. But what’s happening in South Africa right now has nothing to do with fantasy or fiction. On the contrary, it’s all too real. If you’ve not been reading the news from the Cape Town recently, the city is about to run out of water. On January 18th, the city’s mayor, Patrica de Lille, said that the “point of no return” had been reached and that, if things continue as they are with little or no rainfall, by April 12th, the taps will be turned off. The date has subsequently been put back to June 4th, but it’s still a crisis. Day to day life already sounds distinctly uncomfortable. Showers are considered a luxury – one South African wine producer joked recently that he’d come to London to have a proper wash – while even Five Star hotels have put up signs asking customers to think twice before they flush the toilet. And it could be about to get a whole lot worse: disease due to lack of sanitation and even anarchy as people compete for the little water that’s left in the city’s six reservoirs. The rainy season can’t come soon enough in May. Assuming it happens, that is. In such potentially apocalyptic times, discussing the Cape’s wine industry might seem otiose and even a little obscene. When people have no water, who cares if they have enough Chenin Blanc? And yet the agricultural sector, which obviously includes wine, is part of the problem. Farming of various types, but especially the citrus, wine and table grape industries, uses 47% of the Western Cape Water Supply System (WCWSS) compared with 48% by the city of Cape Town. 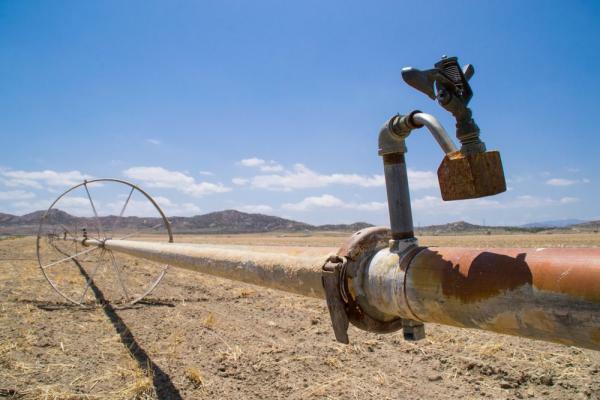 At one point last month, as farmers passed the limit of their target usage, there were rumours that the taps would be turned off completely, anticipating Day Zero by ten weeks. So far this hasn’t happened, but Charles Whitehead of SAWIS (South African Wine Industry Information and Systems) predicts that it will and sooner rather than later. The harvest is currently underway and is predicted to be 10-16% down on 2017, another drought-affected year. Bonsai-sized bunches are the norm and even those are at risk from animals desperate to eat anything to stay alive. Is this part of a cycle or is it something more permanent? This goes to the heart of the debate about climate change. According to a report in The Independent, an estimated 97% of scientists think it’s the latter. Rain may yet save the Western Cape, as did in April 2005, when nearly 100 millimetres fell in a few weeks. But the longer-term problem will not go away. What can South African do about this? Pray is one answer, as boreholes and desalination plants are only partial solutions and the latter is extremely expensive. It might make more sense to find a way to pump and clean up the last 15% of the water that often sits, inaccessible, in dams. And, of course, encourage people to use water more conservatively. The Cape wine industry, for its part, is facing an immediate crisis because of the drought. The harvest is two weeks behind normal and there is concern that late-ripening varieties, such as Cabernet Sauvignon, may not reach full maturity, even with the lighter crop. At the time of writing, it is 42°C in Paarl and some vines are shutting down because of heat stress. Vitis vinifera is a notoriously hardy species, but there are limits. People are already asking what happens next, especially if there is no post-harvest rain. In a country where, according to industry body VinPro, only 15% of cellars are profitable and 51% are “just about hanging in there” in the words of Rico Basson, this could push some businesses over the edge. Mergers, acquisitions and significant consolidation will surely follow. Further drought will accelerate the vine pull rate in highly irrigated, low-profit areas such as the Olifants River, which currently supplies around 220,000 of South Africa’s 1.4m tons of grapes. There is also a question mark over the future economic viability of parts of the more fashionable Swartland. Basson predicts that the country’s area under vine will drop to 85,000 hectares from its current 95,000 hectares within three years. It’s only just beginning to happen, but I think we could also see a shift in the geographical centre of the industry towards the Cape South Coast and the Eastern Cape, where summer rainfall is higher and temperatures are cooler. And in the hotter areas, it surely makes sense to plant more heat-resistant Mediterranean varieties, such as Grenache, Carignan, Mourvèdre and Assyrtiko, all of which are currently under-represented in South Africa. You don’t need to be a modern-day Adam Smith to realise that, in a time of shortage, prices rise. Depending on the area, grapes this year are between 15 and 100% more expensive. South Africa does not have enough wine to supply demand, either at home or overseas, so the highest bidder will win. If anything positive comes out of the country’s predicament, it could be this: the Cape will be forced to charge more for its wines. Those who survive the changes might, just might, begin to show a profit.